We noticed that the PH was too high so after some research we added a teaspon of calcium hydroxide, commonly known as "kalkwasser" in aquarium stores. This has to be diluted in a gallon of water and added slowly over the course of a day. 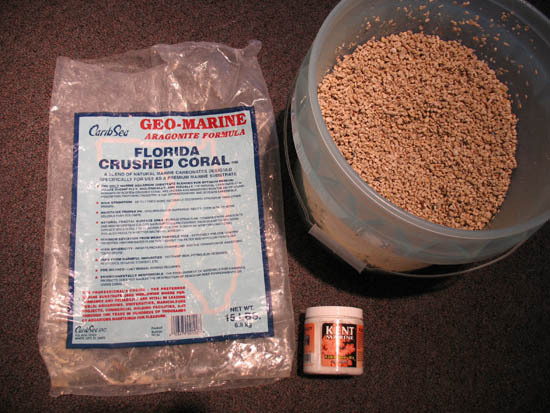 We also learned that crushed coral acts as a ph buffer, so we added about 10 lbs to the bottom of the fish tank. So far it has not clogged up the pump. A benefit of the coral is that the fish enjoy putting it into their mouths and spitting it back out, to get any bacteria growing on the coral. With this the PH returned to normal levels between 6.8 and 7.2. You can use a simple color test available from a home aquarium store to measure and monitor the PH of your system. Other elements we monitor for are: alkalinity, ammonia, nitrites, nitrates and water hardness. We use the Mardel 5 in 1 test strips and test the water twice a week. Mardel test strips.